Bus or Train cards are posted in rails inside of the cab. Individuals read and remember interior bus advertising. 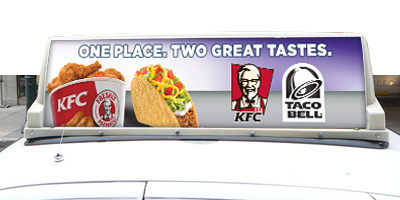 What other form of advertising do you have such a captive audience? While riding, passengers have a chance to read your message and you will be reaching a wide range of people, including parents, students, seniors, business commuters, and more. 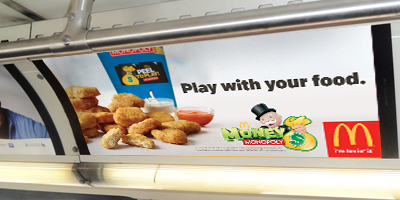 Bus or Train cards can be printed on a variety of different substrates. Most popular are 020 Styrene and Laminated Paper because of their durability. Side Card: 11"x17", 11"x22", 11"x28", 11"x46", 11"x56", 11"x70"
End Card: 22"x28", 22"x21", 33"x21"
Following bus routes along major city thoroughfares and penetrating residential neighborhoods, Transit Shelter advertising can deliver mass exposure or be targeted to reach a specific audience. 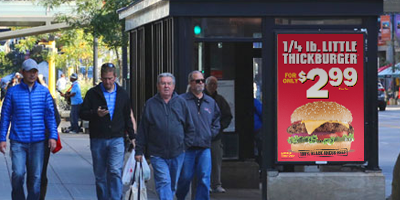 Shelters are a great on-the-street advertising extension of print campaigns. Bus stop advertising also provides coverage in areas zoned out to other media. Dusk-to-dawn shelter illumination of bus stop ads provides round-the-clock visibility to both vehicular and pedestrian traffic. 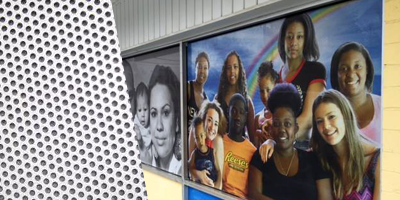 Perforated window film (window perf) turns glass doors and windows into prime advertising space without compromising the view. Window perf is applied to the outside of your window and viewed from the outside. Our Perforated Window film has a 40% open area for optimal two-way viewing with a removable adhesive making it easy to install and remove. Taxi Tops deliver eye-level impact day and night. Highlight your product, increase brand awareness, or run targeted messaging. Taxis thrive in areas where people work, shop, and play, following lifestyle patterns and population flow.